Shop! provides a two-pronged web platform to advertise to the full spectrum of retail environments and experiences professionals. The Shop! website is our primary source for member and event information. It also hosts the digital version of Retail Environments magazine and all our other industry publications, resources and news. Shop! Retail Environments Online is the companion website to Retail Environments magazine. As an extension of the magazine content, it features additional projects, products, news, commentary and more. Digital newsletters provide direct access to 15,000+ industry professionals, including retailers, brands, creative agencies, manufacturers and suppliers. Shop! complements Retail Environments magazine with a weekly bulletin featuring content from the current issue as well as product and project highlights from Shop! members. Distribution: Shared weekly via email and social media, providing more than 75,000 impressions. This weekly e-newsletter provides quick links to industry-wide articles, research, videos, social media conversations, and more that keep you on the forefront of trends in retail environments. Produced exclusively for Shop! by Multiview Media. Details upon request. Member-only digital newsletters and reports provide direct access to Shop! members. The insider package consists of three different, high-value newsletters. One buy associates your brand on more than 80 emails throughout the year. The perfect vehicle for members who do business with other members to promote their products and services. This weekly newsletter keeps individual members informed about association news, important deadlines, and upcoming events. This quarterly members-only publication offers expert economic analysis by the consultants at ITR Economics. Reach members who are serious about keeping up with economic indicators affecting our industry. This report emails to the main member contact bi-monthly and is consistently rated as a top member beneﬁt. 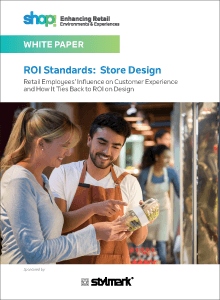 Crittenden’s overview of the retail marketplace and its insights on future development makes this a must-read for C-level executives of companies supplying retail.